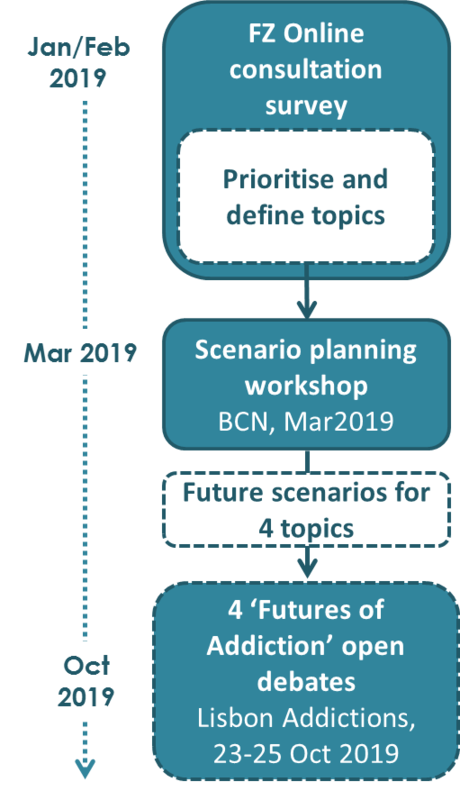 The FuturiZe future scenarios consultation survey is the first step in a participatory process to develop a set of scenarios and a corresponding series of interactive debates at the Lisbon Addictions 2019 conference. This scoping exercise will be used to select and give substance to a set of topics which are likely to impact on the future shape of addictive behaviour and policy. The information you give us here will be fed into a scenario planning workshop to develop 4 future scenarios in addiction and the best way to represent them. These scenarios will form the basis of a series of interactive debates on the key policy and societal actions to shape the future in each of these areas. Completion of this survey is also a requirement for those applying for a bursary to support participation in the debates at the Lisbon Addictions 2019 conference. Read more about the bursaries here. Priority topics for future scenarios in addictions – rate the topics which you consider the most important to debate with multiple stakeholders? Topic definition – give us any additional information on your priority topics. We estimate that this survey should take around 20-30 minutes to complete. I agree to my data being collected and used in this way. Male Female Other I'd rather not say This information will be used for reporting purposes only. No direct experience – I have never observed or participated in a foresight exercise. Some experience – I have observed or participated in a foresight exercise. Extensive experience – I have participated in many foresight activities. Expert in foresight or scenario planning. Please read through the list and let us know your top 6 topics from the table below* in terms of what you consider the most important to debate in a futures perspective with multiple stakeholders? * This list of topics was developed based on the EMCDDA scoping exercise for future issues (started in LxAddictions 2017) and as part of the FuturiZe project proposal, in line with the EU Action Plan on Drugs 2017-2020. The impact of preventive health messages is changing due to new cmmunication techniques being adopted and evolving attitudes and motivations of target populations e.g. delayed gratification, prioritising pleasure over consequences. Other issues undergoing change: unintended effects (e.g. stigma); social views and attitudes to drug use; attitudes of care professionals towards users; role of health systems in influencing lifestyle choices. TREATMENT : New treatment approaches Biotechnology advances and changes in terms of diagnosis, new treatments, and new drugs . Examples include: mainstream alternatives to abstinence, trans-cranial magnetic stimulation, medication assisted treatment, genetic tailoring, vaccines, integrated care programmes. BEHAVIOURAL ADDICTIONS The lack of diagnostic entities prevents accurate monitoring and public health impact assessment . Pharmacological treatment : New research methods into neurobiological underpinnings of behavioural addictions (difficulty of animal models). New insight into social determinants and policy action . Interface with technology . THE BUSINESS OF ADDICTIONS Changing trends in user ("client") profiles and patterns of drug use. Generation Z (millenials): changes in lifestyles, consumer patterns and risk taking; Sociodemographic and geographic trends: Specifics of urban recreational drug use and new routes of administration , implications for monitoring and prevention : potential of social media analytics for monitoring; How social media is shaping social norms of drug use. Marketing (Digital marketing and sale of legal substances and addictive products; consumer trust built between (illegal) dealers and buyers. Participation of public and civil society sectors (social innovation): Improving the scope and quality of user and stakeholder involvement in drug policy making; Setting the agenda for prevention and research priorities; accountability. Industry partnerships and regulation : Code of ethics of the industries related to addictive substances (alcohol, tobacco, cannabis) and behaviours (gambling); Who is taking the lead on shaping the business landscape of emerging addictive products (e.g. cannabis, e-cigarettes, legal highs)? SOCIAL AND HEALTH INEQUITIES Policing and criminal justice strategies: factors related to discrimination (ethnicity, age, gender,…); Intergenerational transmission of substance abuse due to health and social inequities: family and community interventions ; unequal access to prevention and treatment resources; changing levels of inequality.